"They gave us a map with no exits." Wow. What a busy episode, with a lot of changes and a great deal of intriguing set-up for the second season. Oil paint on his hands doesn't make Dante Wallace sympathetic. Why is he lying about the rest of the 100 being dead when some clearly are not? Why keep Clarke from leaving when she was so desperate to go? I believe what Wallace said about the radiation situation, which actually makes sense. I haven't seen anything past this episode and honestly don't know, but I'm betting Wallace wants to add radiation-resistant Ark dwellers to the Mount Weather gene pool. Clarke didn't manage to escape, but give her time because she was awesome. Just in this episode, she (1) took a hostage, (2) initially refused to eat the food, (3) created a weapon out of a high heel, (4) stole a key card, and (5) nearly flooded Mount Weather with radiation. I'm sure she fought so hard because she feels responsible for her people and was imprisoned on the Ark for so much of her young life. Although I absolutely do not blame Jasper and Monty for scarfing down chocolate cake after a life of deprivation. I really liked the repeat of "pull the lever and everyone dies." Not this time. Did The 100 get a boost in their budget? Loved the gorgeous new sets, the blinding white prison cell with white accessories and Van Gogh's Starry Night, the banquet hall with the flags and paintings, although I'm pretty sure some of those paintings were in Europe and how did they get them to Mount Weather in an apocalypse? Also loved the old fashioned trunk with eclectic clothes including heels and pearls. 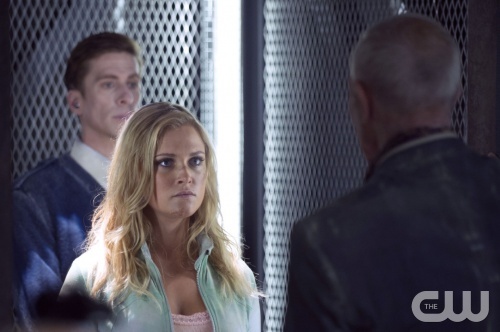 Note that clever Clarke didn't succumb to temptation and chose to wear action pastel sweats instead. Clarke took the sketchbook and pastels, but she's concentrating on maps. If anyone can get out, she will. I hated seeing Bellamy beaten, so I think I'm emotionally invested in him as a character now. He and Finn and the two youngsters were charging Tristan and losing, and enter Kane and his troops in the nick of time. I actually cheered because I wasn't expecting it. Where Kane and Abby landed looked more like the Rockies than the Appalachians and I was expecting them to have to trek two thousand miles across the country or something. And then Kane, who is apparently the new Chancellor by default, ticked me off by treating Bellamy and Finn like teenage criminals with dirty faces. Wait a moment. They are teenage criminals... but still. They're leaders of our colony. But not any more. I sense conflict approaching. Funny how I'm on the side of the kids, now. Especially since Bellamy and Finn are now staunch allies and are ready to steal weapons and go searching for the 48. I'm confused about where Alpha Station/Camp Jaha is. Was that where Bellamy and Clarke got the guns? Tristan, who is now thankfully dead, was all pissed off because he lost three hundred people. This is a bad guy attitude that always confuses me. Tristan and his Grounders attacked the 100 without provocation, the 100 pulled out the stops and successfully fought back, and Tristan is like, hey, how could you? I mean, if you attack someone, why are you surprised when they fight back? "Yeah. I would have shot me, too." Raven is so smart. Seriously injured, and she still got the drop on Murphy, who seems to have gotten a little smarter since the first season finale – either that, or he's faking it for his own nefarious reasons. Raven didn't turn him in. But Bellamy did, and got himself in trouble already. Murphy revealed his tragic backstory (he got the flu, his father stole medicine and got floated, mother died an alcoholic blaming Murphy for it) and Raven said, "Boo hoo." Seems like a common story among the 100, who were all imprisoned for something. Abby can fix Raven. I don't want to lose Raven. Abby also left a message for Clarke. When will Clarke see it? "You brought me to your village." The village of... Washington, DC. The Lincoln Memorial was very Planet of the Apes. And now we know how Lincoln got his name. Octavia is hurt, hallucinating, and learning the local dialect at the same time. That's some complicated multi-tasking. Are we about to meet Lincoln's friends? Octavia mentioned that Lincoln could die a terrible death of a thousand cuts if he is caught. I'd prefer that we didn't see that. So poor Jaha was ready to crack his ancient scotch and pull the plug when what to his wondering ears should... not appear. What? Was he hallucinating, or was that a baby crying? — Mount Weather Emergency Operations Center exists, of course. It's a FEMA station in the gorgeous Blue Ridge Mountains of Virginia, and it's been referred to in a lot of sci-fi and apocalyptic fiction. Philpott Dam also exists. — Yes, hydroponics, but they're growing cocoa beans? I guess that would be a priority of mine, so I'll shut up now. — Dante Wallace is played by Raymond J. Barry, who did an amazing job as Arlo Givens in Justified. We got a brief glimpse of Rekha Sharma from Battlestar Galactica as Dr. Tsing. I hope we see more of her. And speaking of Battlestar, Alessandro Juliani (Sinclair) made it to the ground. Yay! — Where's Anya (Dichen Lachman)? — We got a glimpse of a serious Elephant Man mutant in the woods. That can't be good, because he looked monstrous, and monsters tend to be evil. 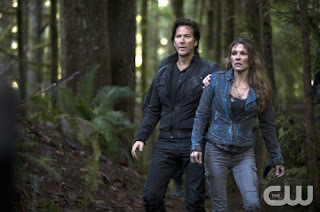 — In this premiere's hair report, I am so happy that the stupid little-girl hairdo Clarke wore during season one is gone. Hopefully forever. Billie, I’m glad you’re into this show now. Season two is really good. Clarke is so badass. She breaks free from the white room, takes Maya hostage, lands on the the Mess Hall and freaks everybody out. And that’s all on the teaser. I love it. Aw, the conflict of teenagers versus adults. Yeah, I was also firmly on the teenagers side. Try to give them some credit, Kane? These delinquents have been freaking dying on Earth and have way more experience there than any of you. Plus, from the stories we’ve heard on season one, most of the teenagers were not delinquents at all. Now that they are all on the ground, the sky people are in serious need of rewriting their laws. I always complain when Finn is annoying, so I should note that, for a change, he was okay. Minor nitpick: for people who were stuck in the Ark for their entire lives, the arkers can sure walk some long distances. Did the “Earth Skills” classes consist of walking endlessly through the halls of the Ark? Fantastic season premiere. The mount Weather underground complex is giving me a lot of vibes of the Vaults from the Fallout video games which are the best of the best when it comes to post-nuclear war apocalyptic fiction. The mountain men didn't even check inside the landing pod or did they just leave Raven to die? I already don't like them just like Clarke does and I feel they will be the main Big Bads of the show not the Grounders.